On Wednesday British Airways attempted to change their recently woeful narrative into something a little more positive. I'm not entirely sure they succeeded. Facing ever increasing pressure from competitors on their business class (Club) proposition, territory they once led, Wednesday was all about a "some jam today, lots of jam tomorrow" laundry list of "enhancements" (BA love this word) from better canapés to new sleeping linens and most of all a new Club Seat in a few years time. It would be churlish not to acknowledge some of the announcement - lounge upgrades, the new dedicated "Wing" at London Heathrow Terminal 5 offers First and Gold / Emerald a dedicated check in, security and walkway directly into the Concorde Room and First lounges and the roll out of fast broadband (much as I hate the thought of connectivity in the last place of digital sanctuary) but I want to focus on the method of announcement. The hook upon which everything was hung. Alex Cruz, BAs CEO who bleeds low cost carrier from ever vein, hosted a blogger dominated flight from London Gatwick, up the spine of the UK and then landing at London Heathrow - a smart way of showcasing new lounges, metal investment (on a new 787 Dreamliner) and all those superficial onboard enhancements. I admire Alex Cruz for anchoring the event and leading from the front - he needs to do this more often, explaining reducing legroom by jamming more seats into short-haul for example. So thats the good part. But let's go back to these bloggers or, as I like to call them "fanboys", for this group was as far removed from either an objective travel journalist or a fare paying passenger as you could get. If you want to see how breathy the feedback from this group went a quick twitter search on #BAinvesting4u will tell you all you need to know. If this group was selected because of their digital influence all they seemed to do was stir up a hornets nest online from BA's regular travellers. The whole exercise lacked credibility and I think signals a broader issue - that we've reached "peak blogger". This was a group who just seemed happy with a free flight, a day out and a goody bag. And I'm not entirely sure BA got anything like the return on investment in terms of coverage or rigour. Simply put an influencer strategy only works when the influencers are transparent and don't flit from freebie to freebie to freebie. What should they have done ? BA should have filled the plane with real customers, a cross-section of people who actually pay for their tickets. What BA might have lost in terms of reach (although some of those bloggers seem to have very low followings) they would have more than made up for in authenticity. The opinions of real passengers would have resonated much more effectively and packaged up by BA would have created a safe but powerful narrative of the changes. It would also have reversed some of the mendacity of language which BA have indulged in. Tautalogical gymnastics where cuts are dressed as improvements undermining their credibility and reduced brand equity. Despite a heavy London outdoor advertising spend, up until Saturday I was determined to avoid commenting on the new Carr's cracker campaign. Then somebody tweeted about it and I knew I was not alone. It is quite the most unappetizing, shockingly bad food based campaign I have ever seen. The photo direction and execution is so at odds with the tag line "Top class cracker meet 5 star antipasti" it's hard to believe that this ever saw the light of day. The only excuse would be if it was shot on an iPhone 3 by a overworked assistant brand manager on a 5 minute deadline. If a creative agency, professional photographer, food stylist or senior brand marketer came anywhere near this campaign they should be dismissed. It has made the product look dry, unpalatable and devoid of any appeal. It makes Carr's, in a very competitive category, look like the sort of product which lurks at the back of the pantry, way past the sell-by-date. Here's hoping it's a short-lived campaign and that none of us find ourselves faced with that at a future party. 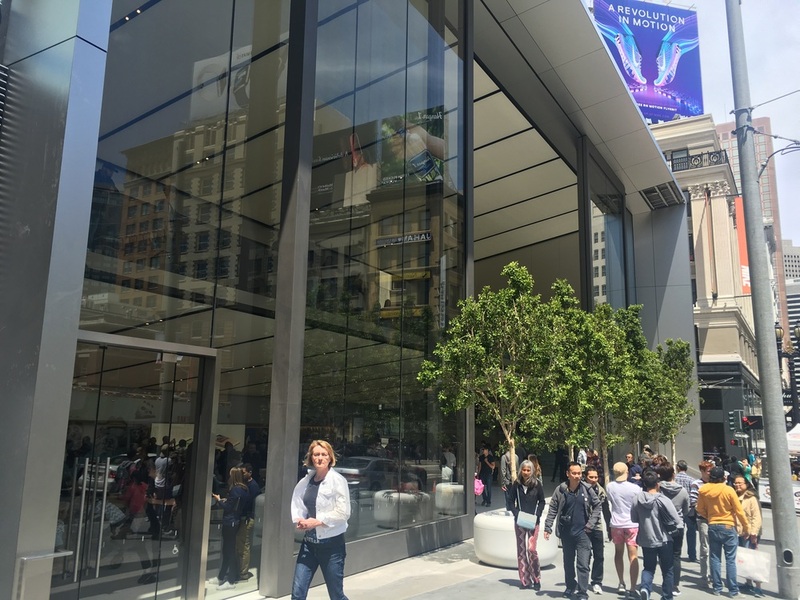 I was excited when I realized that being in San Fransisco for the Financial Times 'Business of Luxury meant I was also going to see the new Apple Store concept a day after it opened. To quote one friend this is "same old, same old" albeit with the twist of bringing the outdoors inside. It's Scandanavian airport meets hotel lobby - and, my biggest bugbear about the current format, it does nothing to absorb people or noise, remains. 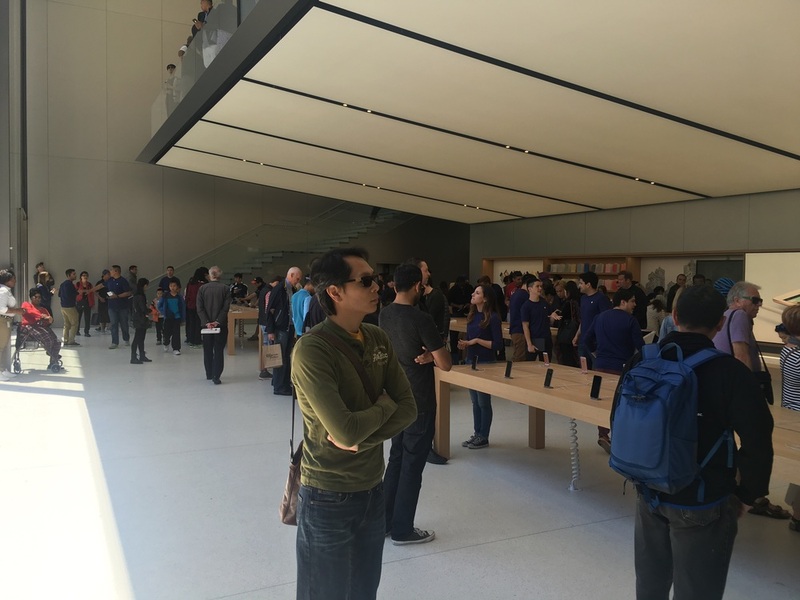 It's still a scrum not conducive to spending a relatively large sum of money. 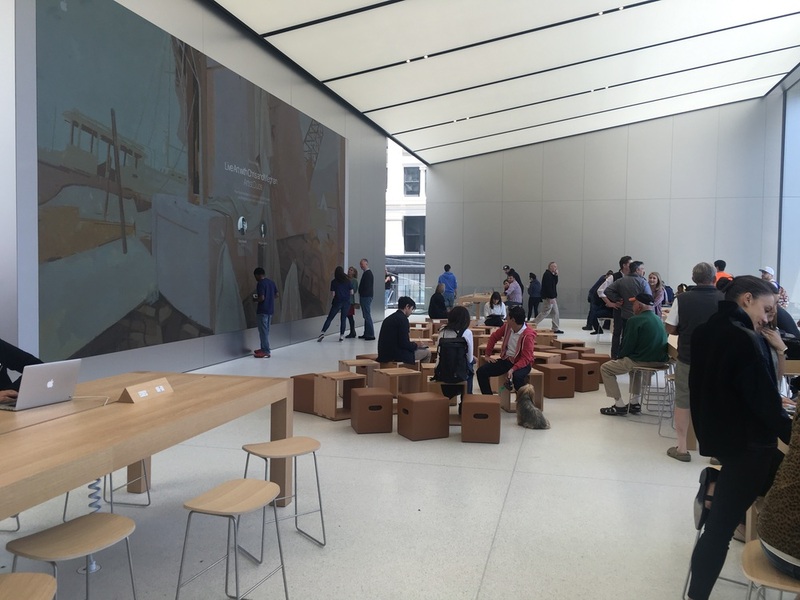 The sheer scale of this environment belittles the product to the point it's hard to find it. Tucked into shelves amongst acres of light wood. The plus points are, without doubt the outdoor terrace, and the massive 'hanger doors' which were wide open to Union Square - but that's not going to be replicable on many of their sites around the world for both space and climate reasons. Without this feature I'm not entirely sure what much has changed. It's a Friday afternoon and I'm writing this during lunch in the Hofbräuhaus in Munich for two reasons; (1) it makes be feel slightly less guilty for finishing the working week a little early and (2) I can't think of a better place to write about ubiquity. The last couple of days has seen the share price of Michael Kors plummet on the back of a very poor fourth quarter and a 7% decline in like-for-like sales in North America. The poor performance has been accompanied by a litany of factors. It always amazes me that brands always quick to blame everything from bad weather to the price of oil on poor performance but never their own actions. It's up to a CEO to factor in resilience and plan growth in a way which is sustainable. Alas Micheal Kors looks like its running a sprint and not a marathon. That works in the short term but in the world of luxury it is not a recipe for success. Luxury brands are more than a high price point and an aggressive expansion of retail points. 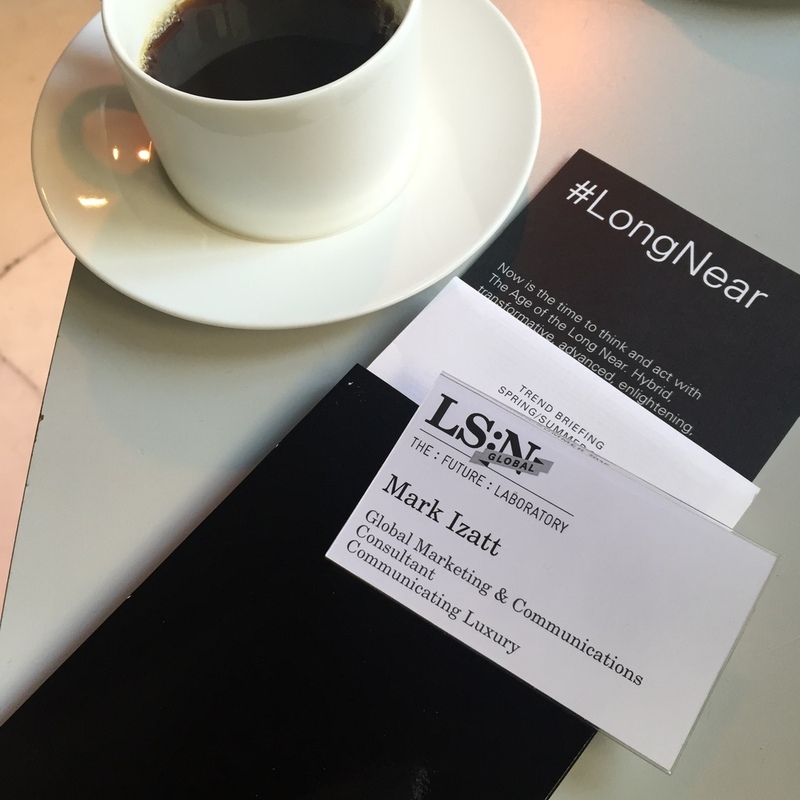 Ubiquity works for Starbucks but it doesn't sustain or nourish a luxury seller of accessories. Simple put, Kors has expanded their retail footprint faster than they have grown their intrinsic equity. A popularity which is a mile wide and an inch deep. Sooner or later, usually sooner, something else will come along and steal the crown. Im currently reading Jean-Noel Kapferer's latest book 'How Luxury Brands Can Grow Yet Remain Rare". No surprises but essential reading which helps make the point that this is a critical subject for a brand owner. Kapferer rightly places Kors into the "masstige' business model. As he puts it "luxury for all". Only luxury can't be accessible to everyone. It can't be on every street corner, especially when it's based on a giant MK logo which identifies the provenance. If you're going to ape Louis Vuitton then have the price points to match. I suspect there is more pain coming on this brand. Which is why my money is betting on the Hofbräuhaus not selling out to become a Michael Kors boutique anytime soon. There is so much bad print advertising out there that when something comes along which stands out for all the right reasons it's a bit of a shock to the system ! And so it was with this ad spread from BMW in the Spectator magazine - inside cover pages 2,3,4 & 5. 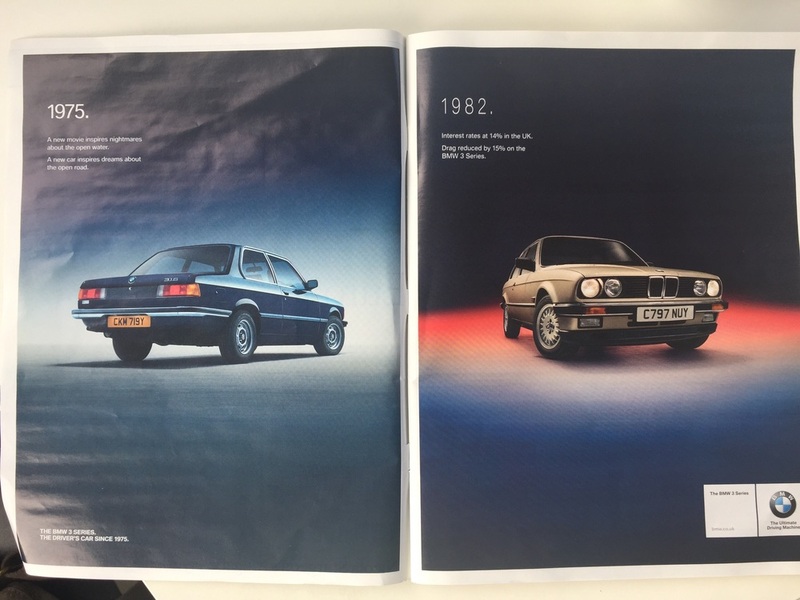 Arresting coloration, minimal text, clever variation of font to reinforce timeline, smart copy which ties in a historical fact (remember the magazine readership) with a BMW fact. It made me stop and turn back, stop and turn back. A confident ad for a brand which knows its audience. Take note.